One of these was parked across the road from my favourite lunch bar last week and it was so cool I almost asked the lady owner for a drive. The '67 to '71 280SL is definitely one of the most beautiful cars you will see on the road today. 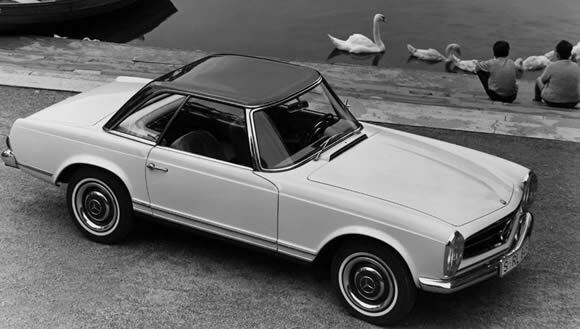 The "Pagoda" style roof on this model SL looks fantastic and really adds some drama (sorry couldn't think of a better word) to the car. The sides of the roof were raised to make entry and exit easier plus it reportedly made the roof stronger. This convertible is one of the few you will look cool in and is a supreme example of beautiful motoring. Read more about the SL here.